Dead Crone Rock is a Forsworn-inhabited Nordic tower located south-southwest of Markarth, just above Hag Rock Redoubt. Upon entering, you will be facing a small stone table with a random soul gem, a taproot and a sample of snowberries resting atop it, and a flight of stairs heading up to your right. At the top of the stairs, an unlocked chest, a large urn and two burial urns on your right may distract you from the leveled Forsworn at the end of a dark corridor in a circular room to the left. Interestingly, two Nordic barnacles can be found in this corridor, far from any water source. In the circular room is a table and chair holding a random potion of magicka and also two bookcases containing a bowl of bone meal, a salt pile a random potion of stamina, a random potion of healing, a leather strip, and a bowl of troll fat, with a horker tusk on top. A spiral staircase in an alcove off the corridor on your right leads up to the second level, with a fly amanita fungus beneath it. There is a leveled Forsworn sitting at a table with their backs to you in the first room. On the table is a grilled chicken breast in a wooden bowl, a bottle of alto wine, and a leveled potion of stamina. To the left of the table is a doorway to a second room where you can see another leveled Forsworn. To the right of the table, among some masonry rubble is another fly amanita fungus. There is also a large urn against the south wall, an adept-locked wooden door on the eastern wall and a gated doorway to the southwest. Through the adept-locked door is a dark corridor that leads to an outside balcony containing an unlocked chest, a large urn, and a bridge to a viewing platform which has a filled random soul gem and a quiver of iron arrows. Proceeding to the back room with the second leveled Forsworn, you will find a very long stone table with benches on either side with an arcane enchanter at the southwestern end. There are four bottles of alto wine, a bottle of wine, a random potion of healing, a random potion of magicka, three loose septims, and an iron sword atop the table. There is a spellcaster trap that spouts flames to your right as you enter; you can see this trap from the previous room through a window. There is an unlocked chest in the northern corner of the room and a corridor heading to the northeast; this corridor turns to the southeast and passes over a flame spout trap in the darkest part of the corridor. It then opens out into a small room with a lever that operates the gate blocking the path in the first room; you can see this through another window. In front of the lever is a copy of the alchemy skill book A Game at Dinner. There is also an unlit brazier containing a sprig of snowberries and two empty petty soul gems. Backtrack to the first room and take the previously barred corridor. Follow the corridor up several flights of stairs as it turns until you reach an unlocked wooden door. Through this door, you come to a broken off tower with wooden stairs rising in front of you. Half way up the stairs is a second floor with an empty bookcase and two food barrels on your right, a table behind and an unlocked chest behind to your right. At the top of the stairs you will see three spellcaster traps which all spout flames, behind this is a stone altar and if you are here completing the Pieces of the Past quest you will find a hagraven named Drascua behind the altar. There is an unusual gem on the altar along with the Dead Crone Rock key, with a word wall for the Dismay dragon shout behind. A boss-level chest is on the north side. If you look back from the top of the stairs leading to Drascua's altar, to your left are some urns that might be easily missed. Next to those urns lies a random soul gem. You can reach them by jumping up from the bookcase, jumping onto the wall that leads around the room, or using Whirlwind Sprint. 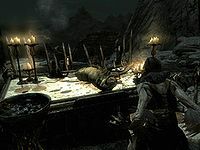 If you have already completed Pieces of the Past and killed the Forsworn leader, Drascua, she will not respawn and is not replaced by a generic NPC boss, which makes it impossible to complete Trouble in Skyrim if Farkas asks you to kill the Forsworn leader at this location. This page was last modified on 10 January 2016, at 20:28.